Fun fact: I’m writing this post, including the recipe, entirely from memory. Usually I’d regard this as an entirely unacceptable process: in my general cooking I’m terribly lackadaisical, grabbing pinches of this and that, pouring salt directly out of the container, etc., but when I’m doing blog cooking it’s like Dr. Jekyll and Mr. Hyde. I turn into this obsessive type A cook, carefully pouring spices into my hand and then measuring them, chopping up ginger and pressing it into tablespoons, yadda yadda. And that’s not to even mention remaking the dish carefully following my own recipe as a backup check, when outside of blogging I’ve never met a recipe I couldn’t alter. But I’m willing to make an exception here, using only photographs as a reference, because it’s so easy. And small wonder, considering its genesis. Picture this: it’s mid-January, I’ve been at work later than expected, there’s no food in the house. I’ve stopped at the store to get some chips and salsa, because alongside a hunk of cheese I’m willing to call that supper. But in this particular store, the salsa is kept with the Hispanic/Tex-Mex foods, and a couple of shelves down was a big can of hominy. I realize that to many people that isn’t exciting at all, but suddenly my mouth was watering, and I wanted pozole so bad. Pozole, for those not in the know, is a stew/soup of Mexican origin: it’s hominy, meat, and vegetables. Or just hominy and meat. Or no meat. Or lots of spices. There are many, many variations, but hominy is key. Taking a step further back, for those also not in the know about hominy: imagine that you have some dried maize. And then you soak it in an alkali solution — made with quicklime, or lye, or wood ash — until the grains swell and change dramatically in texture and flavor. Congratulations! You’ve made some nixtamalized corn! I’m shorthanding rather a lot here, and really underplaying the nutritional and technological miracle of it all, but suffice it to say that you’ve transformed corn into a very interesting food product that you can grind up and use to make tortillas, tamales, dumplings, grits, etc. Or you can just eat it whole. So, where were we? Right, pozole, wanting it so bad. And here’s the deal: like so many classic hearty dishes, pozole is usually a long-cooked dish, slowly cooking the pork (or other meat) into mouthfuls of succulent tenderness. But remember: it’s already dark, I’m tired and cold and hungry. So I took short cuts. Canned hominy, check. Pork ribs? Nah, some fresh, spicy chorizo. And that takes care of most of the spicing, too. Some canned tomatoes and green chiles to give it some more vegetal depth. Round it out with some onion and garlic and pantry herbs, and I had a hearty soup that came together very quickly. 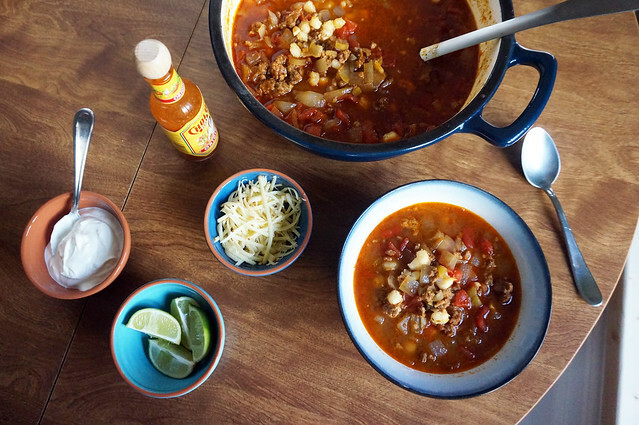 Slow-cooked, careful pozole is absolutely worth the effort, but on a cold January evening, Jarod and I devoured this quick and lazy version very happily indeed. 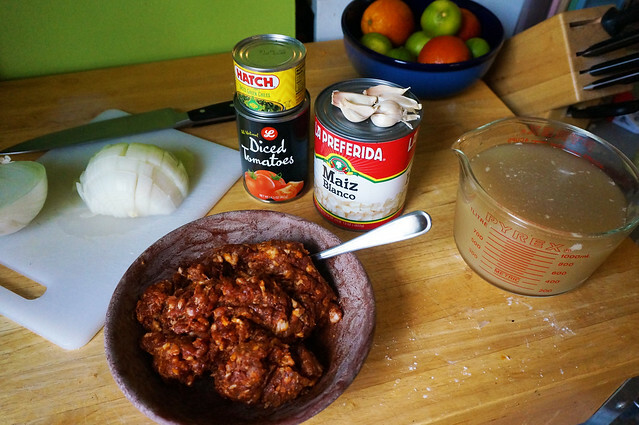 Pozole is one of the classics of Mexican cookery, a rich and hearty hominy stew. It’s also a time commitment, and while it’s worth the time, I don’t always have hours for cooking. 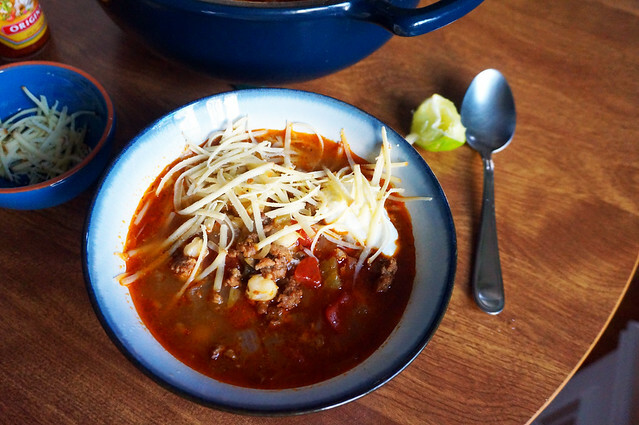 This version uses fresh spicy chorizo to shortcut both time and spicing, and it makes a very good stopgap on a busy, fatigued weekday night. 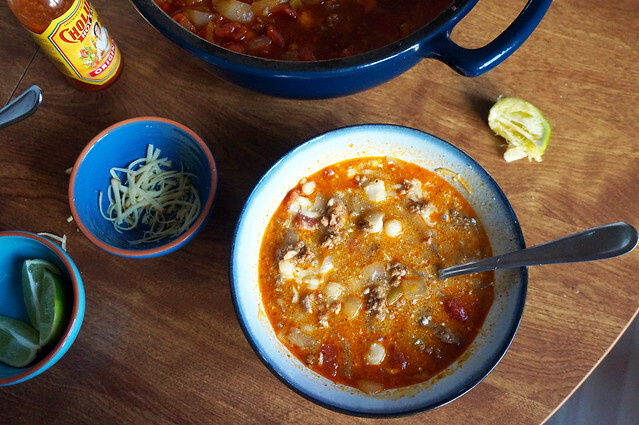 In a heavy-bottomed pot, heat the olive oil and cook chorizo over medium-high heat, breaking it up into bitesize pieces as you go. When the chorizo has only a bit of pink remaining, add the onion and garlic and continue cooking, stirring frequently, until the onion is soft and translucent. Add remaining ingredients and bring to a boil. Reduce heat and simmer for 20 minutes or so. Serve as-is, or with your choice of accompaniments. Epazote’s a lovely herb, and nice to keep around, but hardly central here. You can sub in oregano (which has a different flavor, but goes well), or just omit. If fresh chorizo isn’t available where you are, you could arguably sub in some ground pork. Be aware, though, that Mexican chorizo has a fairly extensive spice list (which is why it’s such an effective flavorant here). You’ll want to add in, at minimum, some chili powder, cinnamon, and red wine vinegar. Bonus points for coriander, clove, and bay. 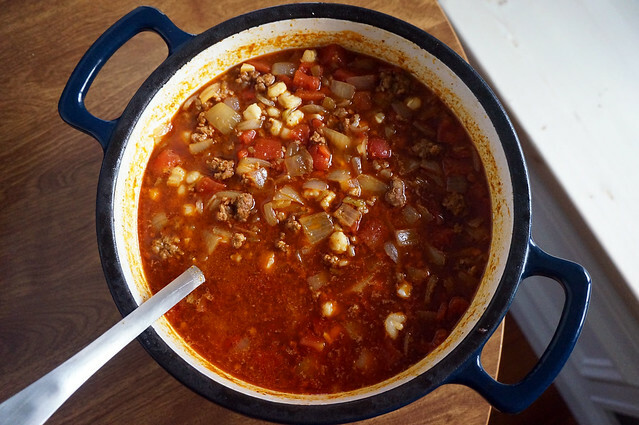 See more details (actually a full recipe for homemade chorizo) courtesy of Nancy Lopez-McHugh, and experiment. Good luck!